To brew means ‘to make a liquid by boiling and fermenting ingredients,’ and we mainly use it to talk about beer or ale. You can also brew by steeping or soaking something in boiling water, like we do with tea. Figuratively, brew means ‘develop’ and also ‘contrive or plan.’ As a noun, a brew is a quantity brewed in a single process and also a liquid mixture, especially one of unusual ingredients, or informally, either a hot beverage, such as tea or coffee, or a beer or ale. Douglas was busy brewing beer. By the look of the sky, I'd say there's a storm brewing. It seems like someone's been brewing mischief. This looks like a good brew. The witches added the tongue of a frog to their brew. Teresa put the kettle on to make a brew. Shall we go for a few brews after work? You will hear the presenter use the word brew to talk about a cup of tea, as well as another common informal term for a cup of tea: a cuppa. 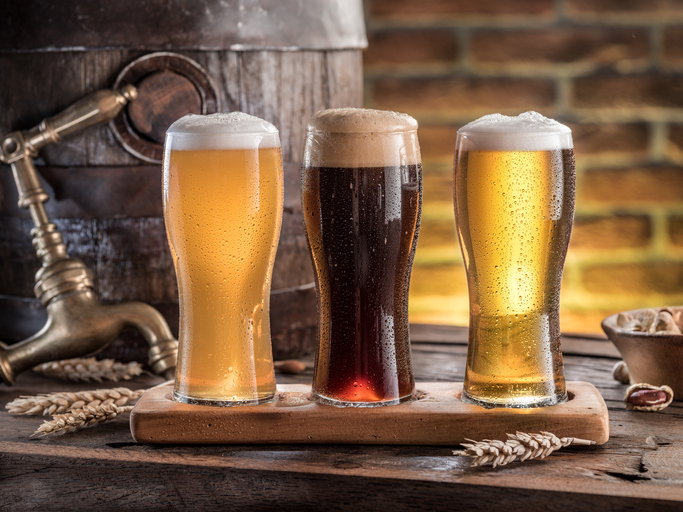 If you hear brew used in the US referring to a drink, they may be talking about a beer. You’ll even find that some people call a beer a “brewski” in certain regions. You’ll also hear brew in relation to coffee, and if someone offers to brew a pot, that’s usually what they mean. Brew, meaning ‘to produce a beverage by fermentation’ or ‘to prepare a beverage by mixing and boiling,’ dates back to before the year 900. The Old English verb brēowan (brewen in Middle English) can be traced back to the Proto-Germanic breuwan (to brew) and the Proto-Indo-European root bhreu- (to boil, bubble, burn or effervesce). Brew is related to the Old Norse brugga, the Old Frisian briuwa, the Middle Dutch brouwen, the Old High German briuwan and the German brauen (all meaning ‘to brew’), as well as the Sanskrit bhurnih (violent or passionate), the Greek phrear (well, spring or cistern), the Latin fervere (to boil or foam), the Thracian Greek brytos (fermented liquor made from barley), the Russian bruja (current), the Old Irish bruth (heat) and the Old High German brato (roast meat), and many English words, including barm, barmy, braise, brawn, brawny, braze, brazier, bread, breed, broth, broil, brood, effervesce, embroil, ferment, fervent, fervor and even Brazil. Both the intransitive sense (to be in preparation) and the figurative sense, in relation to trouble, storms, etc., first appeared around the year 1300. The noun, meaning ‘something that is brewed’ as well as ‘a brewed beverage’ comes from the verb, and dates back to around the year 1500.